Dr. Woodwell Wood Elixir is a unique formulation that cleans wood furniture while rejuvenating and enhancing all types of wood finishes - in one easy step. Wood Elixir solves cleaning problems such as removal of dirt, grime, white water marks, heat blush, mildew, grease, wax, dried-on food & beverage stains, sticky residues from tape or gummed labels, paint smears, paint or stain over-spray, chewing gum, lipstick, magic marker, grease pencil, crayon, lead pencil, ball-point pen ink, smoke smell and cigarette odor, etc. In most cases, simply wipe on, wait a moment, then wipe off! What sets Wood Elixir apart from wood furniture cleaning products? Powerful. While Wood Elixir is easy to use, it is a professional-strength product. Think of Wood Elixir as "furniture medicine" ... often, a small dose is all that's required. 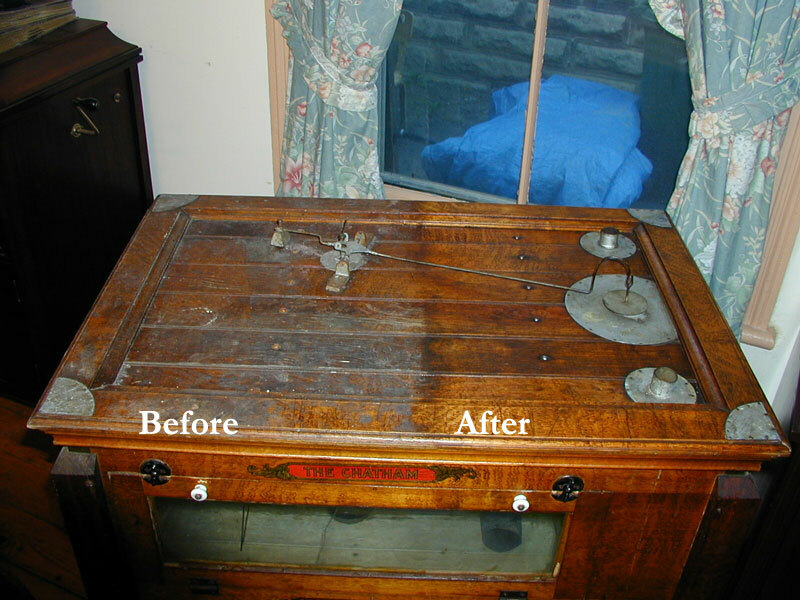 But if the condition of your furniture finish is more serious, then Wood Elixir has the power to clean and restore it. Economical. Only pennies worth of Wood Elixir is all that's usually required to clean away most problems! Time and again, a small amount of Wood Elixir has turned yard-sale castoffs into prized pieces or auction super-stars! Murray Westbrook, a.k.a. "Dr. Woodwell", was born in Toronto, Canada in 1943. He moved from Toronto to the quiet area of St. Thomas, Ontario in 1989, prepared to be actively retired. The activity was the revitalization of the Historic Hamlet of Sparta in the County of Elgin. As part of the project, Murray opened several businesses in Sparta, one of them being "Victorian Times Antiques and Art", a retail antique shop. As a student of antiquities and a wood-working hobbyist with an interest in Victorian furniture, he took to the auctions as a source of supply for his store. Here was the conundrum: the finish on the furniture is frequently in such poor condition as to require refinishing. But, refinishing is expensive and the old finish is more valuable than a new finish. Consequently, you can spend money refinishing and actually REDUCE the value of the piece. What do you do? Murray busied himself with that challenge and, in 1995, came up with the concoction known as WOOD ELIXIR. This is a valuable product and we would like very much for you to give us the opportunity to prove it to you. It won�t take long. Results are often instant and always lasting. I recently inherited several pieces of antique furniture. One piece in particular, a four post bed, was covered in mildew. Without giving further thought Lysol was applied. OOOPPPS! It is for mold and mildew but not mold and mildew on wood. Within seconds white stains appeared on the dark wood bed. I ran to the cleaning cabinet to see what I had to fix the problem. I tried 2 different brands of furniture polish, water and even a wood enhancer but my stains weren't going anywhere. Then, I figured what the heck; I'll try to find a solution on the Internet. I went to a search engine and typed in wood restoration. Dr. Woodwell's Elixir site was the most economical and had the easiest application. I have to admit, for such a low price, easy application and fear of an Internet scam, I was VERY skeptical. I bought the product a hoped that I hadn't been taken for a ride. A week later the product arrived. I was so excited and yet pessimistic. I rushed to the room with my antique bed and opened the package, read the simple steps and began to apply the product. It only took a few seconds for the stain to start disappearing! Within 20 minutes I opened the package, followed the SIMPLE & EASY directions and cleaned everything up. WOW! I was so impressed! I would never help promote a product that I didn't believe 100% in. Where can I get Wood Elixir? Wood Elixir is guaranteed to meet or exceed your expectations. return your purchase and receive a refund. Still have questions? Go to our Answers & Advice page!